How Do You Keep Talking Even When You’ve Said Everything You Thought Possible? Working with miniatures has been on our minds for some time now, alongside of a desire to make work about 'where we are' and to really investigate the specific areas where our work is presented. By miniaturising an area that we did not know well we were able to research what had taken place there and subsequently create and explore our own version of the history of the site. We began with maps and plans of the area around Podewil, before painstakingly mading a version of the surroundings 100 times smaller. To insure the accuracy of our model, we then paced our area with measuring tapes, noting down how many lampposts and bins there were and photographed every side of every building. The never-ending process of trying to document and make a model of a real area that was changing daily was an impossible task. 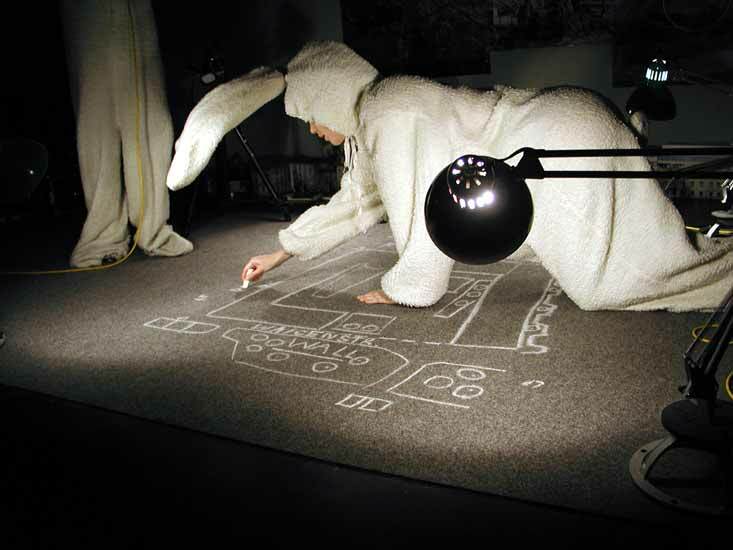 Instead we began to subjectively complete areas that we knew we would film and we used miniature cameras to get into our cardboard city and projected the results huge on the wall. This 'new' version of reality was then strangely readable as a recognisable city - ruptured only by the scale of a hand or occasional foot in the way. In order to play with scale within the piece it was important that we interrogated our own position and the potentially omnipotent position of changing our immediate surroundings (albeit a cardboard version of reality). 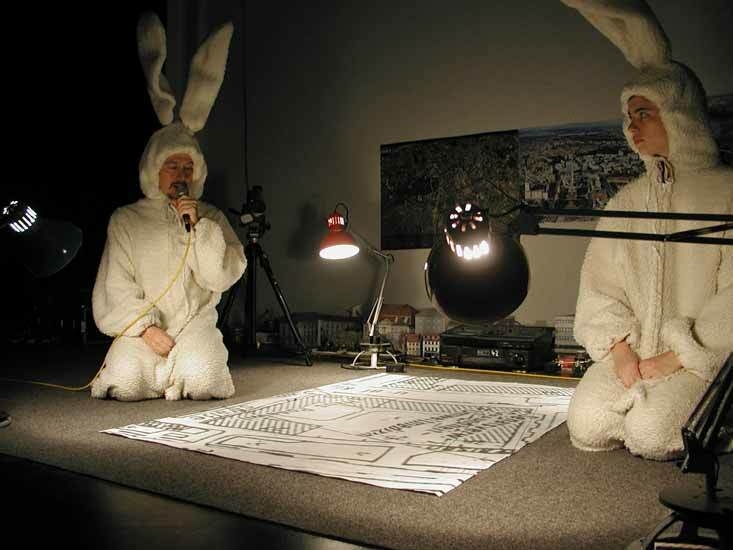 Therefore we chose to be dressed as rabbits, creatures that although small and vulnerable, ran freely around Berlin when the wall was there and proliferated spaces that even some humans could not tread. The only thing left to do was to include 'us' and how we came to be here. To put the 'me' in the city - to include our stories, songs and reflections about the city; fires, weddings, windows, wasps, cars, the weather, films and forests.